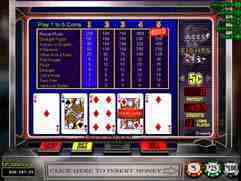 Aces and Eights is a popular version of video poker offered by RTG online Casinos. If you are new to video poker, it is a video version of draw poker. The aim is to try to make hands that rank higher than a pair of Jacks. Once you get the hang of the game you will easily be able to play 20+ hands a minute, now that’s action! This is why RTG Aces and Eights is so popular with players, it is a very fast paced action game. The other bonus is that if you play smart, then the house edge is one of the smallest in the casino. You can find Aces and Eights in the Video Poker menu as one of the Wild Card games at any of our recommended online RTG casinos. Remember to always play for Full Coin because on RTG Aces and Eights the payout for the Royal Flush goes from 250 to 1 for 1-4 coins to a crazy 800 to 1 for the full 5 coins. You’ll be kicking yourself if that Royal Flush hits and you weren’t playing Full Coin. On the other hand, hitting the Royal Flush when your playing Full Coin is a high you won’t forget and it is what RTG Aces and Eights is all about. The other strategy advice is with the Double Ups. On RTG Aces and Eights ties are considered draws, so it is a fair paying game. So by taking on the double up offers you can further reduce the house edge on your overall gambling. In the long run, this keeps more money in your bankroll so you have more chances at hitting that Royal Flush. If you’re looking for a great RTG casino that features the Aces and Eights video poker machine, we’d like to suggest trying out Silver Oak Casino! This reputable online casino has Aces and Eights video poker and virtually every other video poker machine you can think of! Plus, for a limited time, you can get a $10,000 video poker bonus when you make your first deposit at Silver Oak Casino! New players from around the world; including the United States, will be happy to learn that they can get a 400% welcome bonus to play video poker at Slots Plus Casino! This great bonus is worth up to $3,000 in free casino money and it can be used to play all kinds of video poker machines; including Aces and Eights video poker! If you’re anything like us, you’ll enjoy playing all of the different games that are available at this great RTG powered casino! Vegas Casino Online is an RTG powered online casino with one of the biggest video poker bonuses available online. For a very limited time, all new players who make their first deposit can get a massive $5,000 video poker bonus at this reputable online casino! The best part about this bonus is that you can use it on any video poker game that you want; including the Aces and Eights video poker machine! Like we said, this is available for a limited time only, so take advantage of it today before it’s too late! One of the best places to play RTG Aces & Eights video poker is at Manhattan Slots Casino. This RTG powered online casino has been around for several years and has one of the best reputations in the online gambling industry. At the moment, they are currently offering the visitors of our website an exclusive $25 free casino money bonus with no deposit required when you redeem the bonus code 25CBG! This is a great chance to try out Aces & Eight for free without risking any of your own money, so take advantage of this offer today at Manhattan Slots Casino! Aladdin's Gold Casino is a reputable RTG powered online casino that has hundreds of great games to choose from; including RTG Aces & Eights video poker! At the moment, they are currently offering the visitors of our website an exclusive $25 free casino money bonus with no deposit required! Simply redeem the bonus code 25CBG in the coupon section of the cashier and your account will instantly be credited with this free bonus at Aladdin's Gold Casino! At Aladdin's Gold Casino, an established and respected RTG powered online casino, you can play RTG Aces & Eights video poker and hundreds of other real money online casino games for free! That’s right; when you redeem our special bonus code, 25CBG, you’ll get $25 in free casino money with no deposit required! Plus, when you’re ready to make your first deposit, you’ll be eligible to receive up to $8,000 in free bonus money at Aladdin's Gold Casino! Planet7 Casino is a new and exciting online casino that is powered by the wildly popular RTG software. They have the full suite of RTG casino games; including RTG Aces & Eights video poker! To celebrate their recent launch, they are currently giving the visitors of our website an exclusive $25 free casino money bonus that you won’t find anywhere else! Signup today and redeem the bonus code 25CBG to get a free $25 bonus added to your account at Planet7 Casino! iNetBet Casino is one of the oldest and most trusted RTG powered online casino. They are known for offering some of the fastest player payouts in the online gambling industry and they are open to players from around the world; including players from the United States! Right now, all new players who redeem our special bonus code CBG10 will get $10 in free casino money to try out RTG Aces & Eights video poker or any of the other great games at iNetBet Casino! Slots Plus Casino is one of our favorite places to play RTG Aces & Eights video poker because they are currently giving away a massive 400% bonus worth up to $4,000 in free casino money to all new players! This is one of the biggest video poker bonuses available online, which is why we encourage all of our website visitors to take advantage of this great offer. There’s no telling how long an offer like this one will last, so hurry over to Slots Plus Casino to take advantage of this offer today before it’s too late! If there’s one casino that we consider to be a “must play” online casino, it would have to be Aladdin’s Gold Casino. This RTG powered online casino has been around for years and they offer some of the fastest payouts in the online gaming industry! At the moment, they are running an unprecedented new player promotion that awards you with an UNLIMITED number of bonuses for your first 7-days as a new player! There is no limit to the number of bonuses you can claim, no limit to the amount of each bonus, and no maximum cashouts! Visit Aladdin’s Gold Casino today to play RTG Aces & Eights and to claim an unlimited number of bonuses!